Detecto’s PC-compatible AS-330D shipping scale is NTEP legal-for-trade certified and is ready to go whether in a mailroom, shipping department or warehouse. 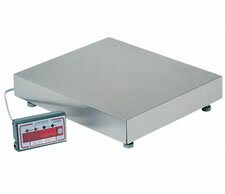 Featuring an easy to read 0.5 inch (13 mm) high, seven digit LED display that may be mounted onto the stainless steel base, wall or counter, and simple On, Off and Zero switches, along with a lift-off stainless steel platform capable of measuring up to 150 lbs; this economical intelligent shipping scale suits all your shipping needs from letter sized mail to large boxes. Switch selectable baud rate, selectable weight on demand or continuous output and ASCII format round out the rest of the features.